Wow! There is so much fun stuff going on it's hard to keep track! Second, guess what I get to do today? Interview the talented author/illustrator Michael Garland - in person! - so that I can share the interview with you on Sunday!!! I know. I said the author interviews this year were going to be the 3rd Sunday of the month. But January started on a Sunday so that one doesn't count! I hope you'll all tune in this Sunday January 22. I'm sure Michael will have lots of wonderful things to share, and I will do a book giveaway in conjunction with the interview. I think something along the lines of comment on which Michael Garland book you love most or would most like to own and why... But maybe I'll think up something to make it more challenging... :) I am open to suggestions... what do you think would be fun? sorry the bottoms got cut off - I had a terrible time uploading these! Reach Out And Read seeks to get books into the hands of children ages 2-5 who otherwise wouldn't have any. In conjunction with this event, we are trying to get as many donations of my books as possible to give away for free to the kids that attend. If you'd be interested in donating a copy of Can't Sleep Without Sheep, Punxsutawney Phyllis, April Fool, Phyllis, Not Yet, Rose, Airplane Flight or Freight Train Trip, you can order from Merritt Bookstore at (845) 677-5857. Tell them the book is for Susanna Hill's Reach Out And Read event and you will get a 20% discount and no tax on your purchase of the books for Reach Out And Read. Open Door will collect the books on February 1st for inventory and transport, so if you're interested, please call before February 1. And now, finally, grab your chocolate and get ready for Would You Read It! Margaret is looking forward to your thoughts on her pitch! Please join us Friday for Perfect Picture Books! I have such a wonderful book to share that I can barely wait to tell you what it is... but I will :) See you Friday! LOL! yes I would read it. Why? Well, when you think of a bird looking for a place to live, you think high places, trees, nooks and cranies of houses, tall buildings, cliffs etc. I would not imagine finding a mouse living up high off the ground. Another thing that caught my attention and made me chuck was the wording, "feather-raising", "house-hunting" (can you picture a mouse and bird going house hunting? lol) and "unconventional" housing. I think the word 'unconventional' got me hooked. :) This seems like it is going to be one fun and hilarious story!! Reach out and Read...putting books in the hands of children who have none! Perfect Picture Book Friday...providing an unbelievable resource of book summaries and activities for parents and teachers. Aww, Vivian, you're so sweet! Thank you so much! I am honored to receive the award from you and just glad if you enjoy the blog! 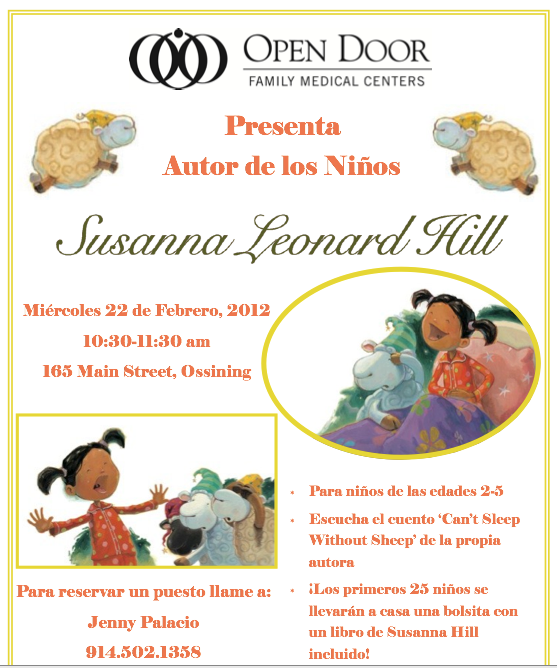 Love your Reach out and Read project, Susanna, and super it is for Spanish speakers too. I confess it is hard for me to pick a Michael Garland favorite, I do love so much of his work! YES, I would most definitely read this picture book. It has great potential for humor and the problem is cool! I think I would try and shorten the pitch just a little. I'm so glad to be part of Reach Out And Read! It's such a wonderful program. And I hate to think of any child growing up without books - every child should have at least one. As for Michael, anything you want me to tell him when I see him today? Any specific questions? Thanks so much for your feedback for Margaret, Saba! I would read it! I think it sounds like it will be funny. I like the reading project! I just realized that the "Reach Out and Read" charity is one that I have been trying to win books for (the Philadelphia Reach Out and Read)! My mom works at a children's hospital and they have a drive for books. It's a good idea to do your own drive! I would read it, it sounds adorable! I smiled at the 'unconventional housing options.' Good luck! Thanks, Jess! I know, aren't those posters so cute? People are so clever and artistic! That's pretty neat that we're working on the same project :) Please tell your mom to let me know if I can ever help her with the children's hospital book drive! I would read it. You did a great job with the pitch! Lots of story-specific and humorous words. Thanks Rachelmarybean! I appreciate the feedback! Yay! Thanks Jess for the feedback. Great! Erik, thanks for the feedback. Joanna, thanks for the feedback. I will definitely take a look at the length. Congrats Susanna on the Versatile Bloggr Award! Vivan -- thank you for the feedback. Did you want to know more in the pitch, or was it an "I want to know more so I would read it" comment? Thanks Saba -- I appreciate understanding your thought process! I would indeed. It will be refreshing change from "property virgins". I don't think it's too long at all. Reach Out and Read sounds like a wonderful program -- so great that you are a part of it. Thanks for the feedback Del. What is "property virgins"? Margaret - YES I would read it! Though I wonder if changing the pitch to be present tense or shortening it up a little bit might make it even stronger and more suspenseful! Good luck with this! It really is a great program, and I'm so glad to be able to do something to help out! It's a wonderful program, and I was honored to be invited to participate with them! Susanna - will you be accepting questions we might have for authors/illustrators you are planning to interview? Margaret - first I am thrilled to have you be a part of the blogging world. congrats on deciding to start a blog. second, i am glad to see the pitch for this story. i love the words "feather-raising experience", great use of words. I think the 1st and 3rd lines could use a little tightening. I think the 2nd and 4th lines are perfect. (fyi- margaret and i are in a critique group. i've read the MS it is creative & hilarious, a fun read. i hope it gets picked up soon as i'm dying to see some illustrations to go with it). Thanks Miranda for your suggestions. I'll take a look and see what I can do! Thanks Darshana! See you Thurs! I recall some shocking experiences when I house hunting, so I am REALLY curious to see what Bird encounters! Hmm...will they become housemates? I love it! SLH - congrats on the ROR event. Terrific! YES. I think Margaret really has a winner here. I would also try to shorten the pitch, but please don't take out "feather-raising" and "unconventional housing!" I think the premise is unique and an illustrator would have a ball with it. Brava - well done! And Susanna, congrats on all your cool news, too! So you're near Ossining - my aunt is a Maryknoll Sister there! It sounds like a great idea. It's already been said below but I too think it would benefit from shortening and thereby tightening up the pitch. Thanks, Renee. Yes, I'm about 45+ minutes from Ossining? And in case you're wondering, I have spent half my day outside in the frigid wind messing with the camera... hair in my face... forgetting the words... freezing... literally... It's going very well! chatterchatterchatter.... I would tell you if my teeth would stop chattering! about the pitch: OH! Yes! I'd read it. Sounds like a great pitch but maybe a little too long. It would be a good back of the book blurb though. Maybe not give away so much. Thanks Clarike. I appreciate the feedback! Susanna- wow, you have some very cool projects lined up! Margaret, Yes I would read it. I also think that maybe it could be shortened or streamlined. Hmmm. Consider take out the last sentence or trying something like "Bird finds the perfect birdhouse... too bad Mouse got there first. Wanting to help, Mouse leads Bird on a hilarious tour of unconventional housing options. As winter looms, will Bird find a nest of her own?" I know I'm totally taking out what a lot of other people liked, and probably lost the character of your story. Just trying to mix it up. Best of luck! Pitches are hard. Yes, I would read it. I love the pitch and can just imagine the houses they check out! Thanks Penny. I see what you mean about potentially having two stories there. I actually don't spend that much time on the feather-raising adventure in the story -- perhaps it's best to leave it out of the pitch. Thanks Jennifer! I appreciate the feedback! Yes I would read it! I love the title and the premise. Great job! Thanks for the reminder about buying your books for Reach Out & Read because of course I forgot! Will do tomorrow!! I'm late to the party again. I may try unsubscribing, and then subscribing again in the early morning, and see if that helps. Anyway, I would definitely read it. I concur with Penny Klosterman that perhaps the search Bird does on his own needn't be in the pitch. I hate to lose the "feather-raising experiences" though. What about something like "After a long search, Bird finds the perfect house, but it's already occupied by Mouse. When Bird asks Mouse for help, Mouse leads him on a feather-raising tour of unconventional housing options. Will Bird find just the right house before winter?" I wouldn't read this book because it's not my kind of read. HOWEVER, I love the pitch. :) It's intriguing, unambiguous, and just plain great! It's the type of book my 4-year-old could convince me to read at least once without me feeling like I'm forced into a major chore. That pitch and story sound awesome, I'm in! Your interview surprise is super! Let the fun begin. Those posters look adorable, best of luck with that great project. You are a busy bee! You're so sweet, Julie! Thank you so much! Thanks Coleen! I hope the story gets illustrations some day! I would definitely read this! Love the idea and how great would it be in the end if Bird and Mouse decided to be roommates? I love the expression "feather raising." I can see it! Love the pitch! As someone who recently navigated the real estate market in NYC to find my place I am truly intrigued by what mouse and bird encounter. :). You should probably edit to tighten it a bit but I do like it! Well done! Marcie, Tracy, Reena, Jennifer, Penny, Roasalind, Del, Vicki, Rachel and Vivian - thank you all so much for your helpful comments to Margaret! Margaret, I would read it. I can just see mouse and bird looking for the perfect house and can imagine what mouse shows him. What a neat feature, Would You Read It?! Yes, I would read this. "...unconventional housing options" is what attracts me, but I think the synopsis is pretty good overall. The title is a bit drab, I'm afraid, but titles are hard and likely to change. Even though I haven't read the story, this idea came to mind based on the little that's conveyed here: If Bird finds other animals living in all the places s/he likes, maybe several animal names can be listed and crossed out before BIRD is finally placed in the phrase. I feel very silly making a suggestion when I know so little about the story, but there it is. Obviously, Margaret will know best. The pitch is interesting and the results could be fun to read and great to look at. Children enjoy unusual ideas and the funny ways, a story can go, so this one would certainly lead them up different paths( or trees!) Lots of laughter too.